For the information and guidance of all concerned, enclosed is a copy of the Office Memorandum No. 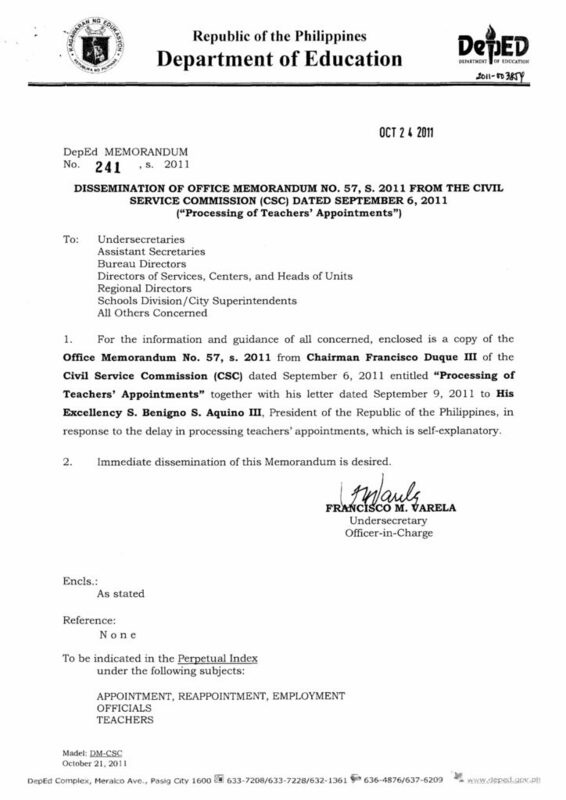 57, s. 2011 from Chairman Francisco Duque III of the Civil Service Commission (CSC) dated September 6, 2011 entitled “Processing of Teachers’ Appointments” together with his letter dated September 9, 2011 to His Excellency S. Benigno S. Aquino III, President of the Republic of the Philippines, in response to the delay in processing teachers’ appointments, which is self-explanatory. Processing or attestation of appointments takes some three (3) months if such requires verification of eligibility, as provided in the CSC Citizen’s Charter. However, it has come to the attention of the Commission that considering the big number of teachers’ appointments submitted to the CSC, some of these appointments are not processed within three-month period. To ensure that teachers can immediately assume the duties of their positions, CSCROs/FOs are directed to immediately act on their appointments with a colatilla that the approved appointments are “subject to verification of eligibility.” However, CSCROs/FOS should ensure that the eligibility is verified within three (3) months from date of attestation of the appointment. This directive shall apply only to teachers’ appointments. CSCROs are directed to conduct, at least once a year, an audit of service cards of teachers to check if verification of eligibility is done within the period set. Heads of FOs should be put to task if they fail do so. Greetings from the Civil Service Commission! This refers to the concern the President brought to our attention regarding the delay in processing or attestation of appointments of teachers in the Department of Education. We would like to report that the Commission has already taken steps to remedy this and to ensure that teachers can immediately assume the duties of their positions. The Commission has already agreed with the Department of Education Secretary Armin A. Luistro on the accreditation of their department divisions under the Civil Service Agency Accreditation Program. Under this program, they shall have the authority to take final action on their appointments, subject to certain terms and conditions. Once accredited, appointments made by the Department of Education shall no longer be submitted to the Commission for approval and therefore fast-track the processing of appointments of teachers. In the mean time, the Commission released Office Memorandum No. 57, s. 2011, copy attached, directing Civil Service Regional and Field Offices to immediately act on the appointments of teachers. Since verification of eligibility takes time, this directive allows immediate action on appointments but with a colatilla that the approval shall be subject to verification of eligibility within three (3) months.